United States Customs Agents were vastly expanded after the 9/11 terrorist attacks on America, in order to continually protect the borders of the United States. These agents put their life on the line every day after having received ample education and training before going into this field of business. They work hard and tirelessly every day to help keep America safe at every border crossing in the United States. If you have your sights set upon working in a branch of the Department of Homeland Security, such as the United States Customs and Border Patrol Agents branch, it is important to fully understand what the job entails and decide if you want to follow this career path. 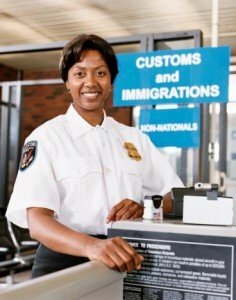 What is a United States Customs Agent? A United States Customs Agent works within the American borders at airports, seaports, and land border crossings. This work is complex with specific focus on high security and safety. This agent is responsible for stopping the smuggling of illegal materials at the border of the United States – whether that be drugs, weapons, money or other illegal materials. Importantly, this requires the full knowledge of over 350 ever changing customs laws. Additionally, United States Customs Agents prevent illegal immigration. When US Customs Agents work with legal immigrants, they must be knowledgeable of immigration laws. Agents must learn the various federal laws and enforce these laws, as well. Agents must prevent people from entering the country without the proper paperwork. Other US Customs Agent responsibilities include the evaluation and categorization of legal goods moved across the border. This occasionally requires that the agent ensure that required duties and tariffs are paid. Agents also investigate the shipment of goods, vehicles, aircraft, and luggage. Their training is to tighten security, apprehending and deporting illegal immigrants, enforce laws of trade, and inspect cargo & luggage. What should a United States Customs Agent Expect? If you have a desire to work in a branch of homeland security, you must be at least 21 years of age or older. Border Agents are required to earn at least an Associate’s Degree (a bachelor’s degree is better) in Criminal Justice or a related field. If the candidate does not have a Bachelor’s Degree, they may need at least three years of training. However, if a candidate has their Bachelor’s Degree, they could potentially enter the force without any experience. After completion of the above conditions, a new Agent will find themselves placed into service at a dock, seaport, airport or border crossing. If an Agent desires, they can take further education and have the opportunity to work in specialized areas of service. Custom departments include overseas work within the United States Customs organization. In conclusion, a United States Customs Agent is a challenging and rewarding career. The person who has a desire to work with homeland security as a Customs Agent has many job benefits. He or she can expect their work to be exciting every day offering an array of situations and problems to conquer.